Jim Swanson is the artist who gave graphic voice to Critical Mass in its first years, creating dozens of powerful images that have inspired people around the world. 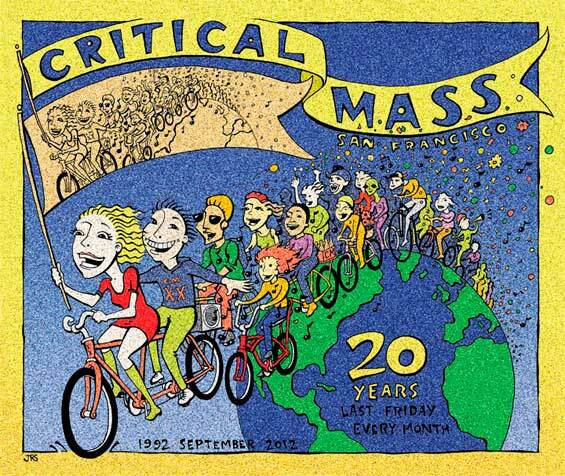 Jim’s new poster illustrates the global nature of Critical Mass, which exists in hundreds of cities around the world. The poster is 15.5″x13″. Hugh D’Andrade has also created a poster! Buy one! You can get copies of each of these posters as well as the new book about Critical Mass, “Shift Happens,” on this page. All sales benefit the artists and 20th anniversary plans.